In what's either the beginning of a Michael Crichton movie or a scientific breakthrough, researchers have successfully revived a 30,000-year-old virus buried deep in the permafrosts of Siberia, the largest virus ever discovered. 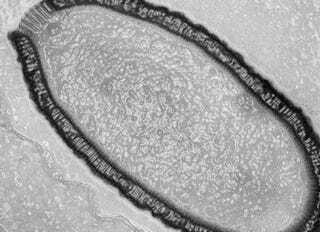 The virus, known as Pithovirus sibericum, was revived from samples from ancient permafrost, which the researchers used to infect amoebas in their lab. Fortunately, they say that the virus is not infectious to animals or humans. Which is good, because in addition to being large, it is also apparently incredibly tough. Giant viruses are not just bigger but are hardier than others as well, said the researchers. This hardiness, along with a favorable environment, likely helped the newly discovered specimen stay intact for the thousands of years that it did. Viruses are often destroyed or rendered inactive by a number of factors, including light and biochemical degradation. "Among known viruses, the giant viruses tend to be very tough, almost impossible to break open," said Claverie and Abergel. "Special environments such as deep ocean sediments and permafrost are very good preservers of microbes [and viruses] because they are cold, anoxic [lacking oxygen], and in the dark." You can read more over at National Geographic, or also check out the whole paper, published in the Proceedings of the National Academy of the Sciences, here.